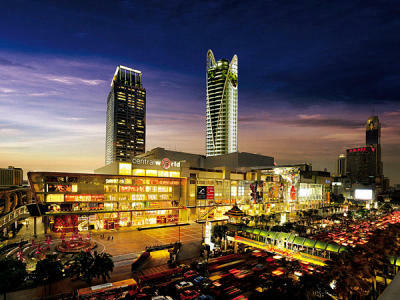 Expansive: A night view of the Central World Mall Bangkok. TO GIVE the local media an idea of what the new mall in i-City Cybercentre, Shah Alam may be like, I-Berhad held a media visit to two malls in Bangkok recently. During the visit, which also saw the signing of Memorandum of Understanding (MoU) between Thailand’s largest retail developer, Central Pattana Public Company Limited (CPN) and I-Berhad’s wholly-owned subsidiary — I-City Properties Sdn Bhd, the media were taken on a tour of the Central World Mall Bangkok and the tastefully refurbished Central Plaza. With over 550,000sq m of retail space, the Central World Mall which is the largest mall in South-East Asia, has 500 different retails including 35 different fashion brand flagship stores and 36 new brands. It also houses six flagship stores, over 50 restaurants and a 21-screen cinema with an indoor parking facilities with 7,000 parking bays. The mall is also connected to a five-star hotel, the Centara Grand and the Bangkok Convention Centre and an office tower. Using creative artwork and sculpture as part of the shopping complex’s interior, shoppers would have a fun experience while the clever zoning system with unique design and ambience makes it easy for them. Although we had limited time at the huge mall, members of the media had a fun time rushing through the various zones. One needs more than an hour or two even to just skim through the floors. Otherwise, the eight-floor mall has a tasteful combination of retail outlets and an impressive area for restaurants and food. A tourist whom I had met at the mall described the place as enormous and said that he had never seen so many eateries in one mall before. “Food is good and I can just spend the whole time here. There are the massages, all in one place and it’s connected to the hotel via the seventh floor carpark — it’s just a walk over,” said the tourist. It is a workable concept that has been successful even in the Klang Valley with malls like 1Utama Shopping Centre and the Mid Valley Megamall. Huge project: Chirathivat (left) pointing out to Lim an interesting feature of Central World Mall. CPN president and chief executive officer Kobchai Chirathivat said the joint venture was the company’s stepping stone to further expand its business in Malaysia. He said the Malaysian government’s consistent policies on foreign investments, the country’s gross domestic products (GDP) growth and the per capita income of Malaysians were factors that attracted the company to invest in Malaysia. “We hope to bring the best experience we have in building and managing malls in Thailand and to hopefully be one of the best retail projects in Malaysia. “As Asians, we have almost similar lifestyles so it will be very compatible to move across the border. “We are very proud to be part of the Malaysian economic development,” said Chirathivat, adding that the mall was still in its designing stages and it would consider the demography and needs of the market as part of the design and concept. Present at the MoU signing were I-Berhad executive chairman Tan Sri Lim Kim Hong, I-Berhad chief executive officer Datuk Eu Hong Chew and Central Group chief executive officer Sudhitham Chirathivat. The event was witnessed by Selangor Mentri Besar Tan Sri Khalid Ibrahim and Selangor state executive councillor Teresa Kok. The i-City mall with a space of 1.7 million sq ft is expected to open at the i-City Cybercentre in Shah Alam by the end of 2015. Construction will begin early next year. The project with a budget of RM500mil, will be located within an 7.3ha plot in i-City and is set to complete the RM5bil Cybercentre’s offering as an international business hub by day and lifestyle haven by night.